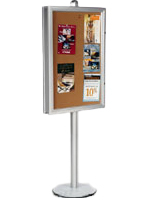 Need a public or private display for showcasing advertisements, awards and other prints? 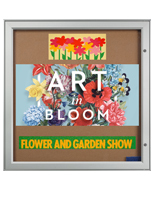 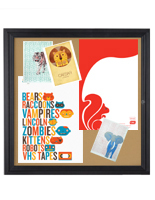 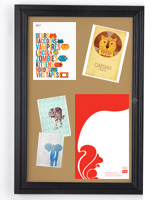 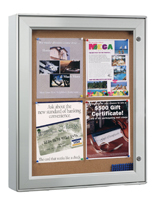 These swing open bulletin boards are great for featuring any poster with their eye-catching design. 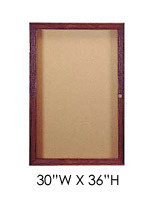 Each fixture has a swinging door with a clear cover for protecting its contents. 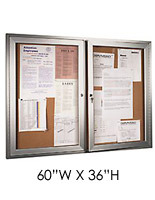 In addition, the faceplate is made of acrylic or polycarbonate shatter-resistant to prevent floors from being covered in broken glass. 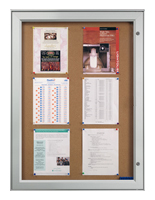 This type of swing open bullet board, or hinged notice frame, is made for safety and thus ideal for offices, schools, gyms, libraries and community centers. 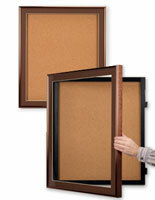 Tackboards like these have an enclosed cork surface that protects their contents from theft and tampering. 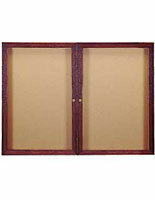 Most models can lock shut to ensure any insert will be safe. 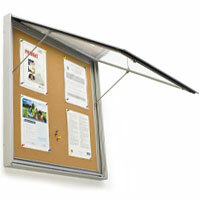 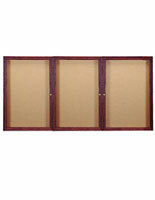 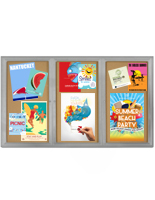 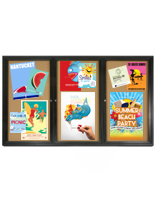 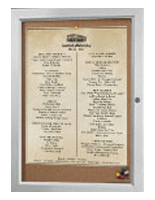 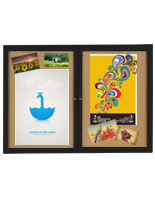 These swing open bulletin boards are available as wall mounts or stands and can be found in a variety of other options. 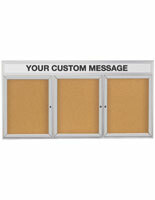 What styles of hinged tackboard are available for purchase? 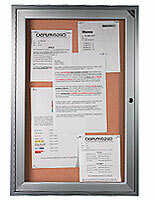 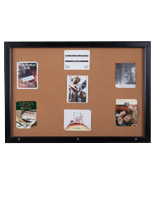 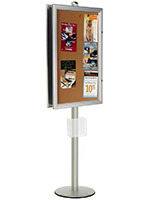 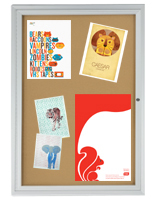 Swing open bulletin boards with a wall mount design feature a straightforward design that is easy to use and set up. 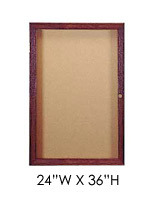 These models can have one, two or three sections with a door for each. 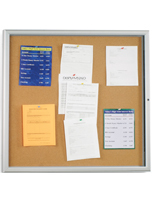 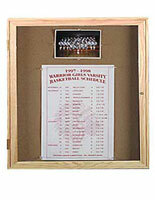 In addition, the pinboards can have a strong frame made of aluminum or wood with an assortment of finish options. 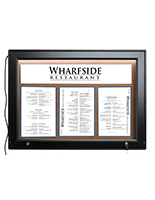 This type of wall mount can come with additional accessories that make it suitable for any school hallway or building lobby. 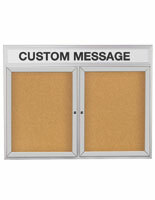 Some units have a header for custom messages that can be personalized with black vinyl lettering. 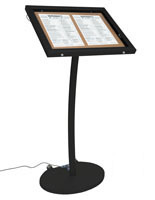 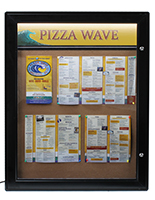 Swing open bulletin displays can come with LEDs for illuminating posters and notices. 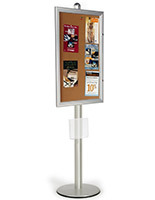 Light-up fixtures are great for highlighting inserts and can plug in to any outlet for use all day. 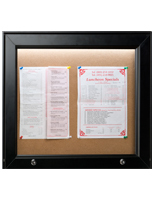 LEDs are energy efficient and have a long life, making these illuminated tackboards a great choice for any user. 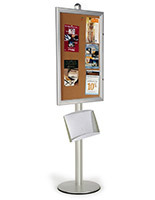 These bulletin boards for schools are also available as standing fixtures. 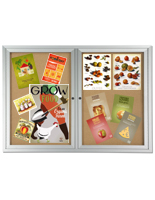 Pinboards for posters like this can feature a vertical enclosed cork surface that is easy to notice from a distance. 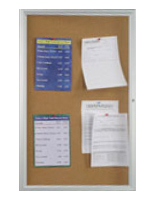 Each bulletin board has a weighted base for added stability and is available with one or two sides for announcements. 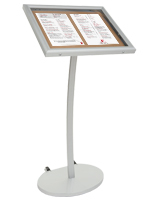 Additionally, they include a literature tray or pocket for dispensing brochures, catalogs, newspapers, sign-up sheets and promotional materials. 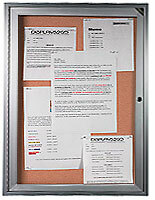 Alternatively, enclosed cork board stands can have an angled reading surface. 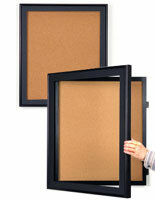 These have a locking waterproof door with a rubber gasket seal that makes them great for outdoor use. 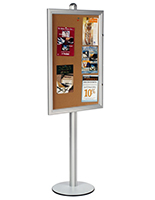 Each unit has (2) built-in wheels that makes them easy to move to a new location by simply tilting and rolling. 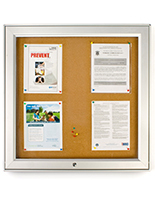 Notice boards like these are ideal for advertising events, reminders, guideline sheets and other posters. 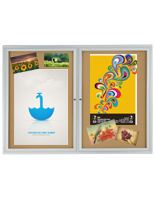 With their hinged door and clear lens, these frames will protect important documents in any high traffic environment. 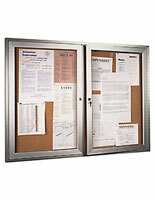 They can commonly be found in the hallways and lobbies of hotels, schools, libraries, dormitories and other open spaces. 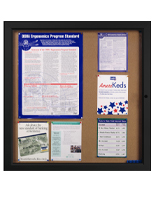 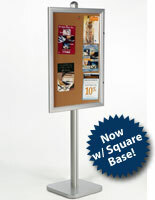 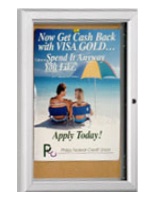 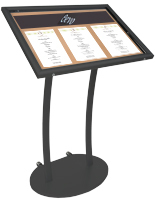 Swing open bulletin displays make it easy to add announcements and only require push pines to attach prints. 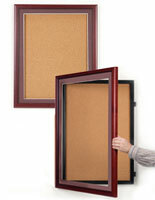 Browse our massive inventory of wares with wholesale pricing on CorkBoards2go.com!